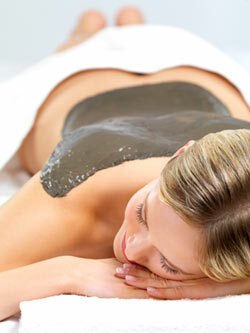 Our luminous mud wrap begins with a full body exfoliation by skin brushing, used for sloughing off dead skin cells, this technique also stimulates the lymphatic and circulatory systems. A warm mud is applied before wrapping the body in heated linens which comfortably raises the temperature in the body to sweat out all toxins and absorb the therapeutic properties from the mud. Enjoy a quick rinse in our five jet swedish shower, followed by a hydrating moisturizer applied to the body. We smooth and polish your skin by applying natural sea salts with lavender e/o oils, or for sensitive skin, an exfoliating cream which removes aging skin cells and leaves your body soft and radiant.